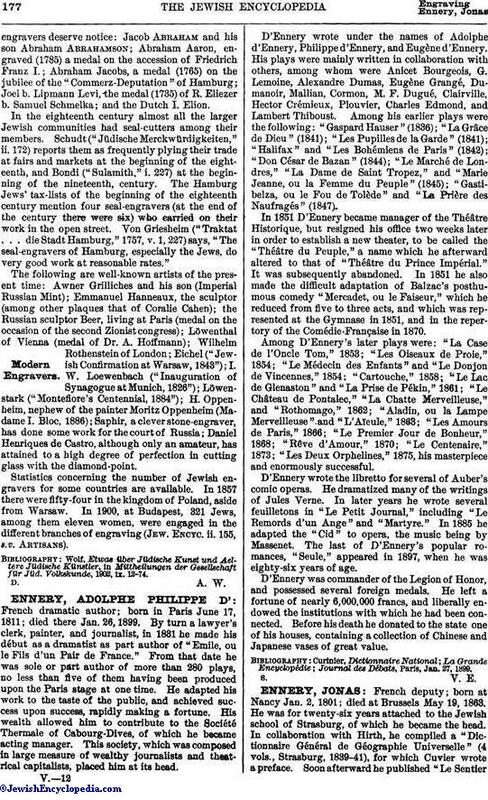 French dramatic author; born in Paris June 17, 1811; died there Jan. 26, 1899. By turn a lawyer's clerk, painter, and journalist, in 1831 he made his début as a dramatist as part author of "Emile, ou le Fils d'un Pair de France." From that date he was sole or part author of more than 280 plays, no less than five of them having been produced upon the Paris stage at one time. He adapted his work to the taste of the public, and achieved success upon success, rapidly making a fortune. His wealth allowed him to contribute to the Société Thermale of Cabourg-Dives, of which he became acting manager. This society, which was composed in large measure of wealthy journalists and theatrical capitalists, placed him at its head. D'Ennery wrote under the names of Adolphe d'Ennery, Philippe d'Ennery, and Eugène d'Ennery. His plays were mainly written in collaboration with others, among whom were Anicet Bourgeois, G. Lemoine, Alexandre Dumas, Eugène Grangé, Dumanoir, Mallian, Cormon, M. F. Dugué, Clairville, Hector Crémieux, Plouvier, Charles Edmond, and Lambert Thiboust. Among his earlier plays were the following: "Gaspard Hauser" (1836); "La Grâce de Dieu" (1841); "Les Pupilles de la Garde" (1841); "Halifax" and "Les Bohémiens de Paris" (1842); "Don César de Bazan" (1844); "Le Marché de Londres," "La Dame de Saint Tropez," and "Marie Jeanne, ou la Femme du Peuple" (1845); "Gastibelza, ou le Fou de Tolède" and "La Prière des Naufragés" (1847). In 1851 D'Ennery became manager of the Théâtre Historique, but resigned his office two weeks later in order to establish a new theater, to be called the "Théâtre du Peuple," a name which he afterward altered to that of "Théâtre du Prince Impérial." It was subsequently abandoned. In 1851 he also made the difficult adaptation of Balzac's posthumous comedy "Mercadet, ou le Faiseur," which he reduced from five to three acts, and which was represented at the Gymnase in 1851, and in the repertory of the Comédie-Française in 1870. Among D'Ennery's later plays were: "La Case de l'Oncle Tom," 1853; "Les Oiseaux de Proie," 1854; "Le Médecin des Enfants" and "Le Donjon de Vincennes," 1854; "Cartouche," 1858; "Le Lac de Glenaston" and "La Prise de Pékin," 1861; "Le Château de Pontalec," "La Chatte Merveilleuse," and "Rothomago," 1862; "Aladin, ou la Lampe Merveilleuse" and "L'Aïeule," 1863; "Les Amours de Paris," 1866; "Le Premier Jour de Bonheur," 1868; "Rêve d'Amour," 1870; "Le Centenaire," 1873; "Les Deux Orphelines," 1875, his masterpiece and enormously successful. D'Ennery wrote the libretto for several of Auber's comic operas. He dramatized many of the writings of Jules Verne. In later years he wrote several feuilletons in "Le Petit Journal," including "Le Remords d'un Ange" and "Martyre." In 1885 he adapted the "Cid" to opera, the music being by Massenet. The last of D'Ennery's popular romances, "Seule," appeared in 1897, when he was eighty-six years of age. D'Ennery was commander of the Legion of Honor, and possessed several foreign medals. He left a fortune of nearly 6,000,000 francs, and liberally endowed the institutions with which he had been connected. Before his death he donated to the state one of his houses, containing a collection of Chinese and Japanese vases of great value. Journal des Débats, Paris, Jan. 27, 1899.